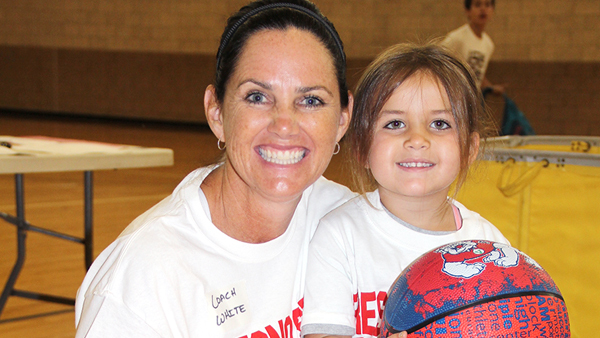 Fresno State Women's Basketball staff and team have an exciting summer camp for daughters of Fresno State employees — offered at a $25 discount. The annual girls' basketball fundamentals/skills camp offers girls in first grade through high school a chance to learn from our team of excellent coaches and players. It's a great opportunity for the beginner or experienced player. This camp is designed to fine-tune fundamental skills in a fun environment. Activities offered range from individual to team contests. Campers will be grouped according to age and ability. Please join us! Early Bird Registration: Register by May 31 and receive 20 percent off camp cost. Multiple family campers will receive a $25 discount for each camper. ALL Fresno State employees get an additional $25 off! Click here for registration form. For more information, contact Tom Perkins 559.278.6061.